Hi there! Today I’m sharing a review for a contemporary YA novel from Sarah Alexander. THE ART OF NOT BREATHING is a little bit romance, a lotta bit grief and healing, as the main character Elsie struggles with the disintegration of her family after the death of her twin brother. Since her twin brother, Eddie, drowned five years ago, sixteen-year-old Elsie Main has tried to remember what really happened that fateful day on the beach. One minute Eddie was there, and the next he was gone. Seventeen-year-old Tay McKenzie is a cute and mysterious boy that Elsie meets in her favorite boathouse hangout. When Tay introduces Elsie to the world of freediving, she vows to find the answers she seeks at the bottom of the sea. This is a well-written novel about a family slowly eroding following tragedy. It is set in the Black Isle of Scotland. Five years ago Elsie’s twin Eddie was swept out to sea while they played at the beach for their 11th birthday. His body was never recovered, and her family has never recovered. Eddie was a smaller child, and though chronologically 11 years old, he was far smaller than Elsie and not able to be educated in the school system due to developmental delays that may have stemmed from gestational issues or a birthing accident. He was several developmental years behind his twin, and Elsie defended him ruthlessly. They have an elder brother Dillon who witnessed some of the events on the beach that fateful day, but neither he nor Elsie, nor their parents, speak of it. Ever. We start out the book on the eve of Elsie’s 16th birthday, with the family preparing for their annual memorial visit to the seashore to pay respects to Eddie’s cross. It’s all very emotional, and bitter, what with Elsie feeling forlorn for the loss of her twin, and the loss of her own celebrations. What she rarely admits to anyone is that she “hears” Eddie within her, and she speaks to him often. She wants to know what happened on the day of his drowning, but no one will ever speak of it. As Elsie makes her way through she suffers horrible bullying, depression, and the knowledge that what remains of her family is disintegrating. Dillon’s got a girlfriend, but there’s something very off about him lately; he’s growing scarily thin. Her father spends as much time at work, or traveling for work, as possible, and her mother is a functional alcoholic. During the course of the book we learn that Elsie loves spending time near the water, as it helps her feel close to Eddie. Eddie was a boy who loved the shore, and the dolphins, and Elsie creates a haven for herself at an abandoned boating club–which is now being refurbished by Mick, his son Danny and nephew Tay. They want to run scuba tours and freediving classes. Elsie has been continually warned against going into the water, but her rebellious side allows her to be goaded into it–and there she experiences flashbacks of that fateful day. Driven to determine the full truth of the horrors of Eddie’s final moments, she begins to train with bad-boy Tay, and eventually the mean and enigmatic Danny, so that she can make deep freedives into the inlet where Eddie drowned. It’s a really fascinating look at the way loss changes the dynamics of a family. There are so many converging problems: her father’s anger and withdrawal, her mother’s depression, her brother’s eating disorder. Elsie, in pseudo middle child form, feels a deep need to piece everything together. The emotions run high, and it’s a thrilling experience for Elsie to have the interest of a boy–for the first time ever. All her training for freediving alters her appearance, and gives her a different mindset–she aches to achieve a final communion with Eddie, and that was really poignant, if rather troubling. I really related to Elsie’s determination, and understood her seemingly flighty nature. No one has seemed to care about her in a very long time, so why should she bother? And yet, she finds the strength to do so. She’s not a very admirable character, in many ways, but I felt that her faults were those of circumstance. She feels as if she’s a pariah, and she’s often treated that way. Tay is the one guy who sees her, not the Twin Who Lived, and that’s a refreshing experience for a girl who mostly fades into the shadows. In all, the book was interesting, and I found myself rapidly turning the pages as the drama became more and more intense. Expect some super dark moments, and a renewed life for a girl whose seemed to end when her twin died. The ending is definitely upbeat. Interested? You can find THE ART OF NOT BREATHING on Goodreads, Amazon, Barnes & Noble. I received a review copy via NetGalley. Sarah Alexander grew up in London with dreams of exploring the world and writing stories. After spending several years wandering the globe and getting into all sorts of scrapes, she returned to London to complete a Master’s degree in Creative Writing at Birkbeck College in 2013. Previous jobs include: tomato picker, travel consultant, mental-health support worker and suitcase administrator. Now she works in publishing. Sarah lives in London with her husband and two chickens. 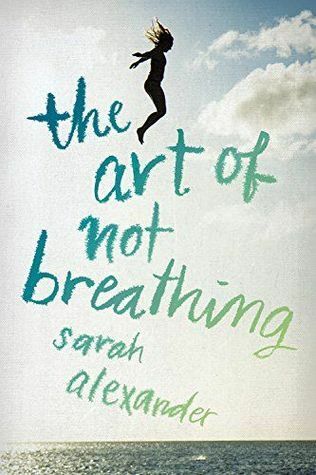 THE ART OF NOT BREATHING is her first novel. You can catch up with Sarah online on her website and twitter.